These event (convention, trade show, concerts) size holders have two pockets to accommodate multiple IDs or event tickets. 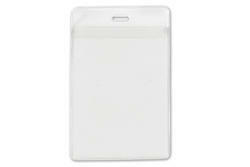 Easily carry convention credentials, tickets and other IDs in one holder. Perfect for concerts or special events.